We specialize in Sportswear for Adults and Children. 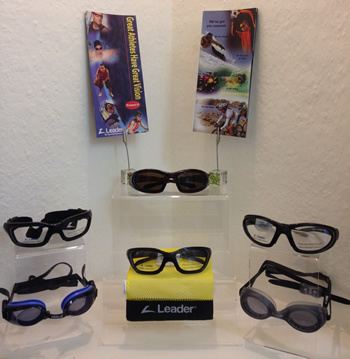 We have a wide range of sporting spectacles and contact lenses designed with the sporting person in mind. The eye wear offers protection against eye injuries whilst playing sport whilst also being stylish. Contact lenses are perfect for extra peripheral vision and unaffected in outdoor sports due to weather conditions such as rain. Cycling, diving, football, golf, gym, motor sports, snooker, skiing, squash, tennis, water sports and many more. Please give us a call 01376 515510 to find out more. We stock a varied range of Sunglasses for you to choose from for all year round. We are also able to supply and fit suitable prescription lenses all of which are UV400 standard for full eye protection. We can also tint the lenses for you in a variety of colours should you require.